While the grass is still green, go play in it!!! Still doubt people care about Climate Change? 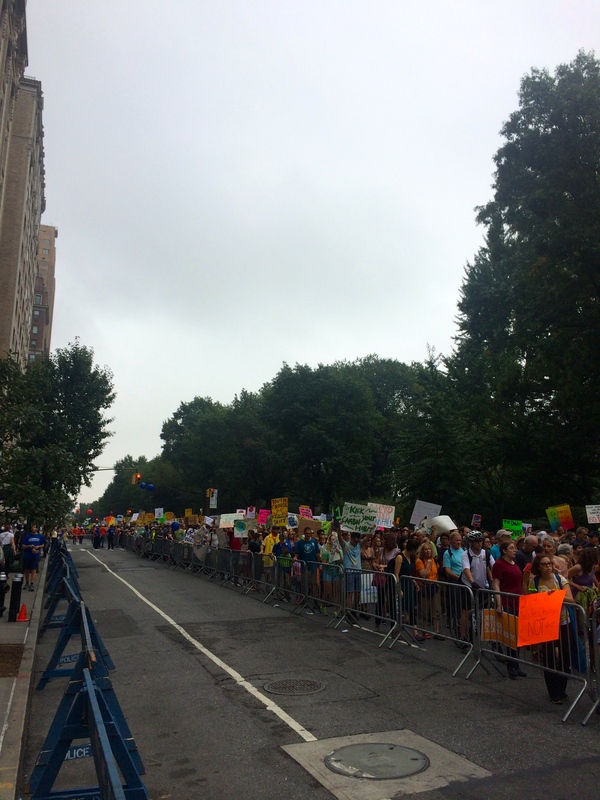 This was merely looking down the block at the Climate March, from a spot on the Upper West Side of Manhattan. Impressive to say the least! There are plenty of photos online that show the true scope of this event that took place this past Sunday, with estimates approaching 400,000 marchers. People from all walks of life came out to show their passion and ultimately their commitment to keeping this Earth healthy and green. There were drummers drumming, and babies with protest signs, there were bare breasted women with painted-on signs, and of course, celebrities. Because what’s a march without a few important people thrown in? There was Sting and his fountain-of-youth-drinking wife Trudie Styler. Leonardo DiCaprio, still recognizable behind a bushy beard and kombucha gut (hey, it coulda been organic beer, but I love my Kombucha!) Mark Ruffalo, who would have been more than justified to come dressed as The Hulk, he is “green” after all. And one of my all time favorites, Ed Norton, a fave because he played a character with my last name once, and he is a great actor, too! Not to make light of the issue at all, but more to show how important it is that even VIP celebrity types were willing to mix it up with the regular crowd for a common, and truly important cause! I certainly hope people were paying attention. I was participating in an event that day marking the International Day of Peace, so I wasn’t able to march, but we talked about the issue at home, and the way the schools are working to educate about Reduce, Reuse, Recycle, for example, is crucial. The event made me realize how important it is for our kids and our kids kids, to be able to have an environment they can thrive in, and that means lowering our fossil fuel consumption and reducing the amount of harmful chemicals in the air! I want my kids to roll in the grass, and swing on the swings, and play soccer in the fields without having to worry about asthma. It’s a shame that we have to worry, but in the meantime, I’m not raising boys in little bubbles (big ones really, because they’re all so tall), I want them out in the fields, and tumbling on the grass, because then they can truly appreciate this green planet! 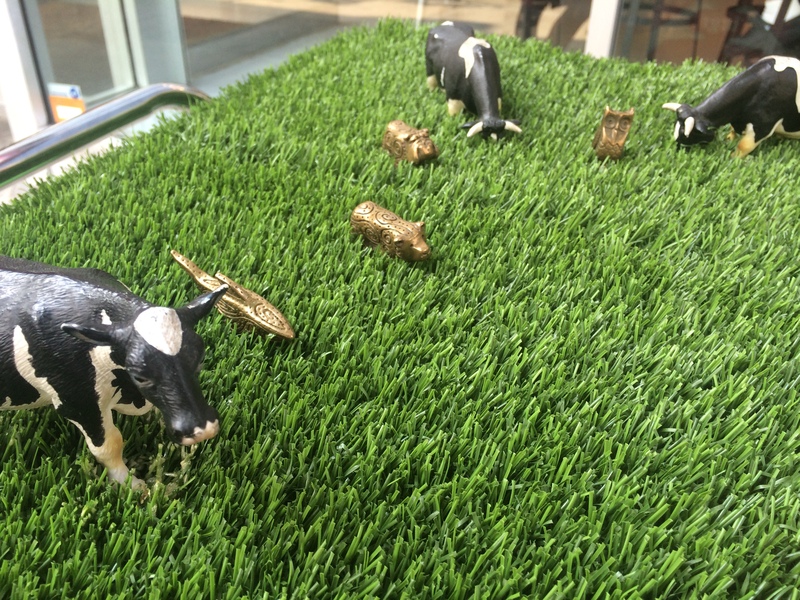 Totems in the grass with Cows! Want a Totem to play in the grass with you? Order one today!! Click on any of the Totems on the left to buy one now.